Vintage Mink Sleigh Bed For The Dog That Has Everything. 33x24x20. 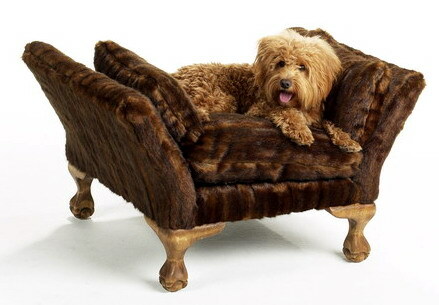 This is a magnificent bed fits in any decor with its light wood combination and mink looking fur. This bed is for the dog that has everything.Each piece is lovingly crafted by hand with a sturdy hardwood frame and fine luxurious fabrics. Pillows are filled with soft yet strong high quality poly fiber and a synthetic fabric preserving the beds loft and resiliency. Removable slip covers can be washed or dry cleaned, according to the chosen fabric. You will love it and so will your baby.